One of the biggest drivers of cost for a housing unit is its size, and when it comes to single-family homes, square footage has been on the rise nationwide for decades. The increase in size can be particularly evident here in Arlington as the modest colonial revival, and ranch-style homes initially built in the area are being replaced with much larger homes, often at prices more than double or triple the value of the original houses on the same lot. If larger sizes drive up costs, then smaller sizes could help reduce them, potentially producing more affordable or moderately-priced options for people in our community. However, several options that could assist in creating smaller housing units are not currently allowed to be built in Arlington. At the most extreme end of the spectrum are tiny homes, which have recently sprung into a nationwide movement. Tiny homes, which are often less than 500 sqft in size, can be an option for those looking to downsize, or for communities seeking affordable housing options. Additionally, the tiny homes can help fill in gaps in policy and funding for communities desperately in need of housing for a burgeoning homeless population. Quixote Village in Washington state provides an excellent example of this use. One of the most significant challenges with tiny homes is where to place them; even if a tiny house could be built affordably, minimum lot sizes in most communities would render the homes unaffordable due to the high cost of land. One solution is to cluster several of these smaller homes together to form a cottage housing community, also known as a “pocket neighborhood” (see pocket neighborhoods designed by Ross Chapin Architects and developed by The Cottage Company in the AHS Missing Middle Gallery). These kinds of clustered neighborhoods are also not allowed in most communities due to zoning limitations. However, some communities are taking a second look at their codes to see if other options are possible. A good example is our neighbors in Falls Church. They have been advancing a plan for a community of small homes under their newly adopted cottage housing ordinance. The Falls Church cottage ordinance was passed in early 2017 as a way to provide more affordable housing options to seniors looking to downsize and stay in Falls Church. 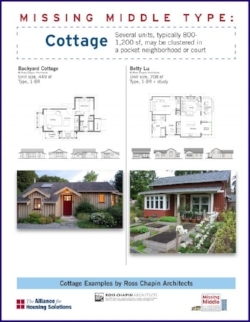 The proposed Railroad Cottage homes are around 1,500 sqft in size (larger than tiny homes but smaller than most other new single-family housing) and face into a shared green space. Another option to make tiny homes or cottage housing feasible is to place the homes on existing single-family lots as a detached accessory dwelling unit, a.k.a. backyard cottages. These homes are built by the homeowner as either a rental unit or a secondary living space for family members, caretakers or others. A detached accessory dwelling unit can be constructed as a standalone structure or incorporated as part of another structure such as a detached garage. As with the other options described above, this type of detached unit is also not currently allowed in Arlington. However, detached accessory dwellings are presently under consideration in the potential rewrite of the County’s accessory dwelling regulations. If approved, the new rules would open up an important new housing option for both homeowners and renters. As we lose housing options that are affordable for our aging population, families, and those with moderate to low incomes, detached accessory dwellings can help fill that gap while maintaining the character and charm of our single-family neighborhoods. 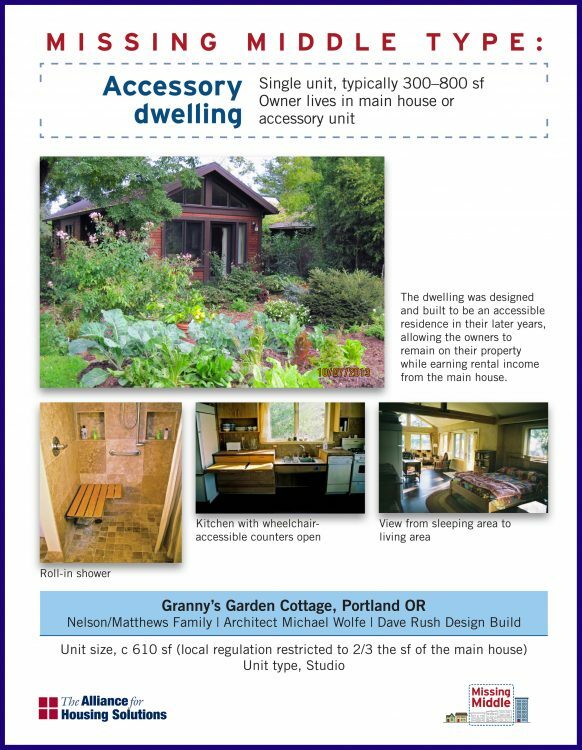 The accessory dwellings can also assist existing homeowners to age in place by providing a source of rental income, or space for family or caregivers to live.